The UK is currently responsible for the release of around 3 per cent of the world's global greenhouse gas emissions, despite having only 1 per cent of the world's population. UK energy industries are the largest single contributors to UK greenhouse gas emissions, contributing over a third (54 million tones) of the total amount of carbon dioxide emitted in the UK. To help lessen the effects of climate change, we must reduce the level of greenhouse gases emitted. This can be achieved by generating our energy from sources that emit low or even zero levels of greenhouse gases, such as renewable energy. We can also make sure that we use energy as efficiently as possible. However, these are not either/or options. Green energy is the need of the hour, if we have to save our Earth from the harmful effects of emissions. Using solar panels to utilise solar energy is seen as one of the biggest contributors towards this green revolution. So, it makes perfect sense to harness solar energy. Advanced Professional solar panel system services can help you with any repair, maintenance on your existing solar hot water or solar heating system and even new solar panel system that you need to get installed for your homes, offices, commercial or domestic buildings . Our solar panel installers can give you all advice you need, discuss about the whole project. We are pleased to offer this service. This is to help you cut down the expense and help environment. Give us a call if you are one of the environment’s lovers. Come and save the world with us! Save the world! Save the future! Advanced Professional solar panel system services can help you with any repair, maintenance on your existing solar hot water or solar heating system and even new solar panel system that you need to get installed for your homes, offices, commercial or domestic buildings . Our solar panel installers can give you all advice you need, discuss about the whole. 1. In the simplest panels, Sun heats water flowing in a circuit through the collector (the panel on your roof). 2. 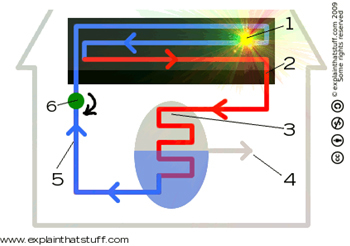 The water leaving the collector is hotter than the water entering it and carries its heat toward your hot water tank. 3. The water doesn't actually enter your tank and fill it up. Instead, it flows into a pipe on one side of the tank and out of another pipe on the other side, passing through a coil of copper pipes (the heat exchanger) inside the tank and giving up its heat on the way through. 4. You can run off hot water from the tank at any time without affecting the panel's operation. Since the panel won't make heat all the time, your tank will need another source of heating as well—usually either a gas boiler or an electric immersion heater. 5. The cold water from the heat exchanger returns to the panel to pick up more heat. 6. An electric pump (powered by your ordinary electricity supply or by a solar-electric (photovoltaic) cell on the roof keeps the water moving through the circuit between the collector and the water tank. Is my home suitable for solar water heating? 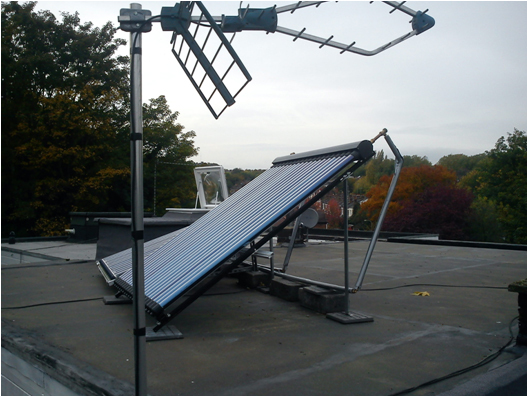 A good location for solar water heating (SWH) collectors is a south-facing roof which is free of shade has a tilt angle of between 20 and 50 degrees. However, even panels facing due east or west can face reasonably well. The figure on the left shows how the performance of a solar water heating system depends on the tilt (pitch) angle of the roof as well as on the orientation. 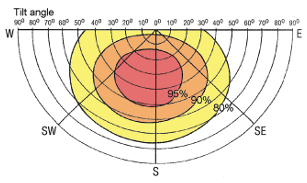 For example, the figure shows that a solar panel mounted on a south-west facing roof with a 40 degree tilt would produce 5% less output than a panel with perfect tilt and orientation. Even panels facing east or west can still produce 80% of the output of perfectly oriented panels. Rooftop panels are the most common, but they can also be mounted at ground level. 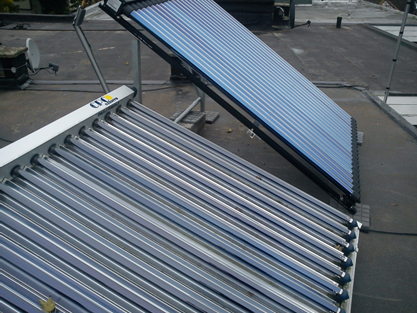 The SWH system heats water in a cylinder, therefore it is difficult to add solar water heating to a heating system that doesn’t have a hot water cylinder (e.g. a “combi” gas boiler which heats the water on demand when you turn on a hot water tap). Roof mounted panels are usually a ‘permitted development’, so you won’t need planning permission. 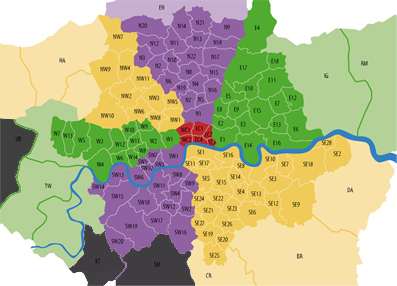 Exceptions include National Parks, Areas of Outstanding Natural Beauty, conservation areas and listed buildings. lar panel system to be installed or wanting to discuss the project with our solar heating specialist London.